c) her mother is in prison. To change anything about these dire circumstances seems impossible. Then she meets a True Wolf, and Little Red Riding Hood gets swept up in the struggle against the evil Queen. I stay in bed. I have no desire to get up, to feed the chickens, to work on Father’s farm any longer, and I am also sick of being called Little Red Riding Hood. I would rather be a warrior, the best and most feared swordswoman in the whole country. Little Red Riding Hood - avenger of widows and orphans! The glorious fist of justice! Drat! That stupid name ruins it all. Zora. That would be a good name, promising swords and adventures. “Don’t dawdle any longer, Little Red Riding Hood!” Father shouts. “Coming!” I jump out of bed, get dressed and hurry down the stairs into the kitchen. Father sits at the table, glowering at me. “Morning,” I murmur and rush out of the door before he starts showering me with insults. Reaching the henhouse, I start my daily work: collecting eggs, raking up the droppings and spreading chicken feed. Actually, I like the chickens, the way they cackle and stumble over one another getting to the grains, as if they hadn’t had anything to eat in ages. It just annoys me that they belong to Father. I walk over to the house, where Father stands in front of the door, waiting for me. I hand him the basket with the eggs. “That’s all?” he asks, frowning. “I’ve looked everywhere! Really!” I defend myself. Murmuring something about lazy hens, he hobbles back inside. Like every other morning, I wait for him instead of leaving this place once and for all. When he comes back, I follow him to the cowshed, grab the milking stool and the bucket, and begin to work. Everything made of milk is delicious: cream, butter, cheese. Thinking about it makes me hungry, but we have to milk all the cows and stow all the milk churns on the horse cart before I will be allowed to make breakfast. It has been like this every single day since Mother left. She used to make breakfast and bake bread and pancakes for me. She used to take me in her arms before sending me off to school. “Yes, Father!” I reply and continue to milk. Finally, Father leaves, heading for the butter churn. I watch him go, wishing he would never return. I wish for this every day, hitherto with no effect; he hasn’t been struck by lightning, neither has he stumbled across cutthroats. No wild animals have shied the horse, overturning the cart and breaking his neck. None of this has happened yet, but I don’t give up hope. I turn around and go back to the house. If the bread isn’t baked and the house cleaned when he returns, he will beat me again. Milking, mucking out, cleaning, cooking, baking, scrubbing, picking, weeding, harvesting. Work on the farm never ends. The work isn’t half as bad as eating dinner with Father. It would be easier to bear if he were mute. I imagine him opening his mouth and not being able to utter a single sound, trying again and again until his face turns as red as fire, until all the mean words lace up his neck and choke him. With this happy thought in my mind, I cut myself a piece of cheese. “You’re a bad girl, but the hard work will teach you to be obedient. Who knows? If you try hard, I might even find a husband for you one day,” Father says. “Yes, Father,” I reply and take a big bite. “Sure, Father,” I murmur, chewing on. 5.0 out of 5 starsA lighthearted romp through an old classic. If you are looking for a quick read that delivers a mixed cast of well defined characters that take a a couple of classic tales mixes them together with a compelling twist then this is the book for you. 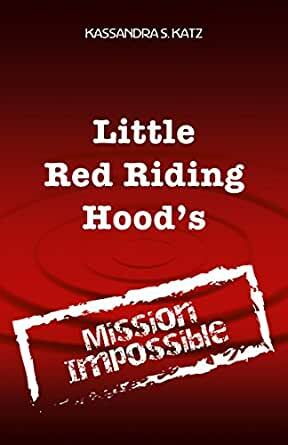 Meet Little Red Riding Hood, a girl struggling with her stereo cast persona due to having been saddled with a name that she had long out grown. In search of an identity that will allow her to break out of a troubled child hood at the hands of an abusive father she finds a "true" friend in an unlikely character who helps to show her that she is more than her oppressive life had allowed her to be. With a steady pace and a few twists we see a young girl find the strength she had inside herself all along so that she can evolve and flourish into the hero that she was all along. Not only can she save her self ,she finds the courage to help another fairy tale heroine rise up and end her own oppression and end the tyranny that has crippled the kingdom. With injustices righted and wrong do'ers punished and new friendships forged we are left with a story that can stand on it's own or form the back story to more to come. 4.0 out of 5 starsAbusive dad, wolves and a really sucky first name. What's a teen to do? What kind of name is that? Mom is imprisoned for trying to save you from your abusive dad. Farm work and housework every day, all day. The only break is when your dad, occasionally sends you into the woods to Grandma's house. You pretend you are Zora, "the avenger of widows and orphans, the glorious fist of justice." Then one day you meet a wolf. This book is a fresh take on Red, not the story, but the person. She is still in a "fairytale" land but it is more a "fantasy" genre than fairytale. Her father is abusive and she is forced to flee with her grandmother into the woods. She becomes involved with rebel forces fighting to overthrow the evil queen. This is not a children's book, although it is not vulgar it is just written for older readers. If you enjoy YA fantasy fiction you will want to try this one out. 4.0 out of 5 starsRousing tale with a gusty heroine! This is a very inventive and charming tale that is loosely based on elements from fairytales (more than just Little Red Riding Hood). It's a rousing tale of the battle of good against evil and the triumph of justice. The device of the wolf is particularly creative. Red is no silly, clueless girl; she's gusty and intelligent with imagination and spirit. The writing style and tone is (with a few exceptions of a slang word or phrase) also in keeping with the language and cadence of a fairytale. I think this story would appeal to anyone from teens to adults. It's a quick, satisfying read that I enjoyed a great deal. This book was a good book for young teens. It was presented well and the characters and story line were very well thought out. I also enjoyed the quick read. The story was told from the vantage point of (Little Red Riding Hood) Zora. Zora is a teen who is terrorized by an evil father and wishes for his death and her freedom. When she meets Raphael, a True Wolf, she gets part of her wish-her freedom from her father. In a bid to free her mother, Zora and her grandmother work with Victoria (Snow White) and Raphael to return Victoria to power as the Queen. Zora infiltrates the castle as a maid and quickly makes herself a good servant that is noticed by one of the Queen's consultants. Together with others Zora and her grandmother and Victoria work to free those the Queen has imprisoned for defying her. The story ends with a surprising twist. I am ready for the next book by this author. I received this book free as a gift in return for an honest review.